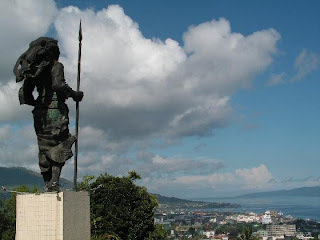 Ambon, the provincial capital of Maluku, is built on a hillside overlooking the bay. It has a number of interesting historical and cultural sites, among the remnants of forts built the Dutch East Indies Company during the heyday of the spice trade. The ruins of the Pourtuguese fort at Hila are almost entirely hidden beneath the contorted roots of a giant Ba¬nyan tree. The ANZAC War Cemetery near Ambon town is the site of serviced held every year on April 25, to commemorate the Allied soldiers who died in region during World War II. The museum Siwa Lima has a fine collection of local arts and crafts. Ambon is at the Maluku end of the annual yacht race between Darwin, Australia and Ambon. The race usually takes place in July and August.